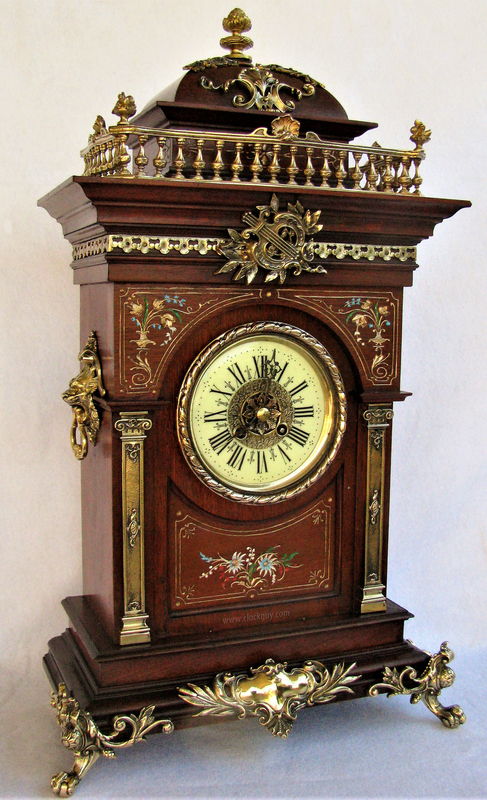 Lenzkirch clocks were of such fine craftsmanship, wonderful ornamentation, and superb "in-house" design that they rank at the top of all German-made regulators. In fact, the varied movements and richly decorated clock cases practically priced them out of the market. Factory-produced clocks were first credited to the Lenzkirch Uhrenfabrik, located in the small town of Lenzkirch in the German Black Forest region. The Lenzkirch factory came into full production in 1860, and continued until 1932. Its products retain a worldwide reputation for excellence to this day. 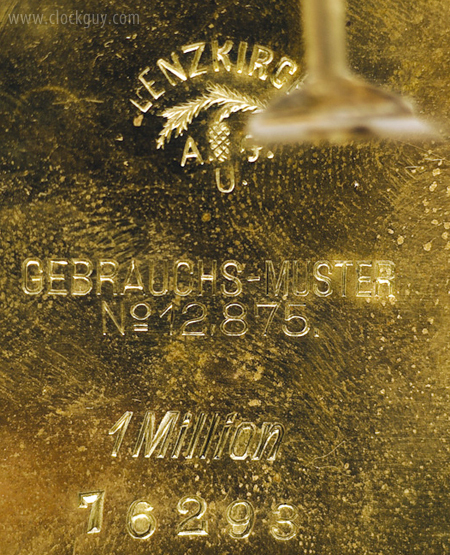 Their value has consistently increased amongst collectors (see the serial number table below for Lenzkirch dating). The Lenzkirch Clock Factory, or Aktiengessellschaft fur Ukrenfabrikation, was founded by Eduard Hauser who was born August 21, 1825, the son of a teacher. Eduard Hauser first gained experience making music boxes in 1840 with Johann George Schopperle. Hauser learned many skills related to this apprenticeship, such as metal working, precision mechanical work and the design of musical instruments. During this time he also gained a knowledge of musical composing. Eduard Hauser, perhaps becoming restless and wanting to extend his mechanical know-how, felt that clockmaking might be a better business in which to be involved. He left the small music box business and studied clockmaking in England, France, and Switzerland. Hauser felt that if he could put the precision factory methods of the French, English, and Swiss to work for him in the Black Forest, it would certainly make the area competitive with the rest of the precision clockmaking countries. 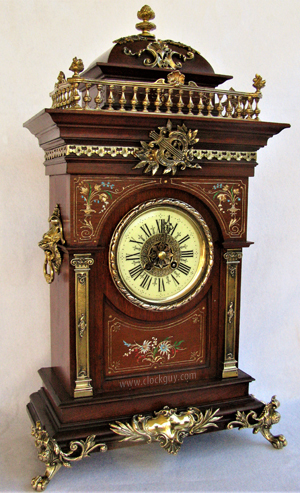 Up to this point in time, Black Forest clocks, such as cuckoos, did not have a good technical basis or reliable reputation for precision. Hauser first worked with Ignaz Shopperle, opening a small machine shop where clock parts were made for other clockmakers. Hauser was trying to introduce a method whereby precision parts could be passed to an assembly line and the movements would be put together versus the old method of the clockmaker making every part by hand, assembling the clock, and praying that it would turn out okay and run correctly. Both partners received technical aid from Robert Gerwig, the director of the newly established clockmaking school in Furtwangen, who also believed in this new method of clock assembly. Working in Shopperle's organ factory, Hauser supervised his employees and produced the precision clock parts using machinery which along with fixtures and raw materials, was bought new, draining the accounts of both partners. There was a real need for more cash flow to market the movements they manufactured. On August 31, 1851 Eduard Hauser joined forced with Franz Josef Faller (1820-1887), Nikolas Rogy, Johann Nikolaus Tritscheller (1825-1867), Paul Tritscheller (1822-1892), and Joseph Wiest, to form Aktiengesellschaft fur Uhrenfabrikation. In 1856 Albert Tritscheller (1833-1889) also joined the others and spent time learning new manufacturing methods in other countries. In 1857 Franz Josef Faller, Paul and Nikolaus Tritscheller, and Eduard Hauser were guiding the clock factory. Eduard Hauser designed machinery far advanced for this time period, and made precision clock parts from his automatic machinery mills. Under his leadership the Lenzkirch clock factory developed and gained a solid reputation for making excellent and reliable timekeepers. It gained a reputation that no other German factory had acquired so far. Eduard Hauser wanted his sons to continue their educations and hoped that some day they would take over the reigns of the factory. 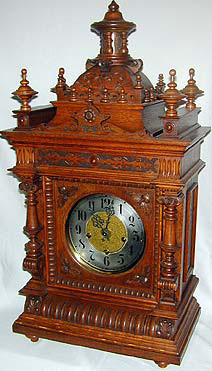 His oldest son was an excellent architect and the Lenzkirch clock cases reflected his influence for about thirty years. His son Karl August was apprenticed under Jess Hans Martin (1826-1892), master clock and watchmaker in Freiburg/Breisgan and teacher at the Badenia Trade School for clock and watchmakers in Furtwangen. This prepared Karl to take over and supervise the tool and die making operation. Paul Emil Hauser, the youngest son of Eduard, helped in the development and assembly of machinery. His training as a tool and die maker helped prepare him for the aforementioned task. All of the people mentioned previously helped the Lenzkirch clock factory achieve a reputation for making good quality, reliable clocks. The regulator clocks had a worldwide reputation for their quality and reliability. These came into full production about 1860. Lenzkirch was awarded gold medals in the industrial exhibitions in 1860 in Villingen and 1861 in Karlsruhe. Weight and spring driven clocks became very popular, the latter having many different style from which to choose. Lenzkirch made their own springs for their clock movements, and also sold them to other clock factories. Franz Joseph Faller helped to market the Lenzkirch clocks by devising a sample catalog of inventory that was on hand or could be manufactured. There was a wide selection of models that were produced. The customers could order from the catalog; once the order was received in their office the Lenzkirch factory would then fill the order. Faller also worked with Paul Tritscheller to connect the city of Lenzkirch with the existing railroad system, but in the meantime horse-drawn wagons carried clocks over mountain roads and stormy conditions to the railroad stations at Todtnau and Hammereisenbach. Winter months seemed to hinder all clock shipments. By railroad, clocks were shipped to various parts of Europe for further shipment to England, the U.S. and other parts of the world. In 1887, the railroad system was connected from Freiburg to Neustadt. 1887 was also the year Faller died, and the Black Forest had lost one of its leaders in the clockmaking industry. He was the one who had initially decided that the manufacture of Black Forest clocks should be done on a large, production-type method in order to become competitive throughout the world. Faller helped to change the production methods of the Black Forest clockmakers. He also helped the city of Lenzkirch by establishing a watch and clockmaking school which made it possible for other clockmakers to develop large scale industrialization. He still supported the small cottage clockmakers and believed they should also survive in the Black Forest, producing clocks in the same way they always had. He did not want to see them merge with other large clock factories. The Lenzkirch clock factory employed thousands of workers over an almost 80 year period, at one time employing a work force of 600 workers. During this entire time period, they made every effort to continue to produce quality clocks and always kept the Lenzkirch Clock Factory's reputation intact. Because of this, business flourished most of the time, the exception being in times of Depression in 1866, 1870, 1876 and 1892. Edward Hauser retired March 1, 1899. In 1900 the company employed 480 workers, the largest in the Badenia Black Forest. Eventually two of Hauser's sons went to work for a competitor, The Hamburg American Clock Co. in Schramberg. The competition in this clockmaking area of the Black Forest eventually caused the Lenzkirch firm of Schramberg. In the middle of the Great Depression in 1932 the buildings were sold by the Junghans Brothers, who operated it as a satellite factory for about four years, and then the famous factory of the Lenzkirch Clock Company was gone. The clocks, however, live on and have today become very popular among clock collectors throughout the world. Their products helped to establish the Black Forest clocks worldwide reputation for quality. It is the opinion of many that the Lenzkirch factory was the best industrialized factory in the Black Forest. No other factory decorated as many of their cases in the way they did. Brass decoration and walnut and oak were used on many of their cases. Richly decorated and high grade movements make them accurate and attractive to timekeepers today. The LFS and Winterhalder/Hofmeier clock cases came close to Lenzkirch standards, but Lenzkirch, it seems, was the best. 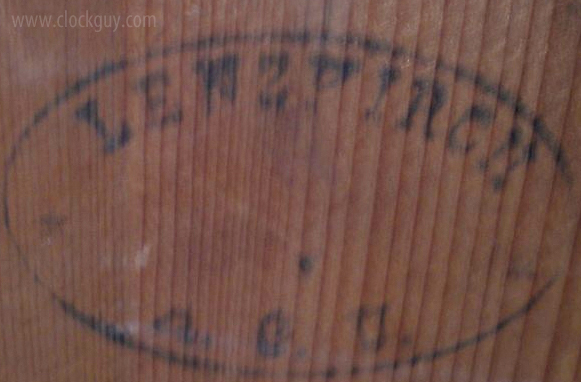 Some Lenzkirch clock cases are stamped with the factory name on the back of the case. In the late 1870s the firm could not stamp their movements with the trademark when exporting to certain countries. That is why you will find unmarked movements on many Lenzkirch clocks. Left: A fine Lenzkirch tallcase open-well clock in absolutely fabulous condition. 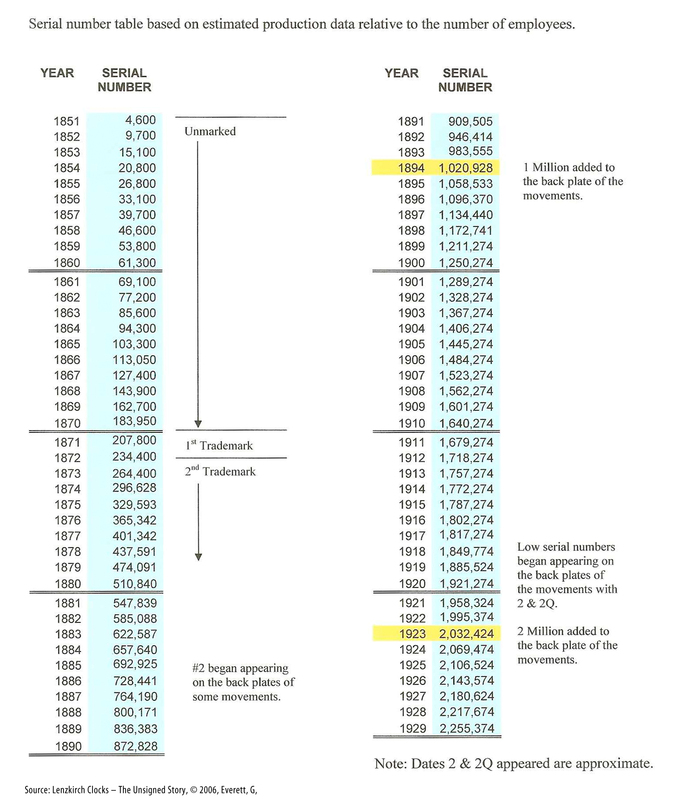 The chart below provides another (purportedly most recent) list of the serial numbers and their corresponding years of production and is very useful for Lenzkirch dating. The source is Lenzkircher Uhren. 1851-2001 (150 Jahre). Aus der Geschichte einer bemerkenswerten Uhrmacherzeit. (Literal translation: "Lenzkirch clocks. 1851 - 2001 (150 years.) End of the story of a remarkable watchmaker time." This book was published in conjunction with a 2001 commemorative exhibit in Lenzkirch, Germany, celebrating founding of the Lenzkirch Factory 150 years earlier. We'd guess this to be the more accurate of the two charts though there is another one on this page that may be the best of all. Visit the Black Forest town of Lenzkirch today. You may want to vacation there in this quaint "Haus Baader" guest house! in particular, weight-driven regulators or tallcase clocks. in particular, for weight-driven regulators or tallcase clocks.